As a service to our patients, we carry one of the highest does of quality pure form of re-esterized Omega-3 Supplements on the market today. Not all omega-3’s are created equal. PRN omega-3 products contain a concentrated amount of both EPA and DHA in a cleaned triglyceride form. Many other brands of omega-3 products are low quality, unpurified, or are sold in a synthetic, ethyl ester form. This form is more difficult to absorb, can leave a fishy odor or after-taste. It could take up to 40 capsules to equal the same benefits found in just four capsules of PRN’s products. Many store-bought omega-3s are in a synthetic (ester) or unpurified form, which is difficult to absorb and leaves a fishy odor/aftertaste. PRN omega-3s are in an ultra-purified triglyceride (rTG) form, which is a similar form to a piece of fish, but without the impurities. Because dry eyes have an inflammatory basis, omega-3’s have been instrumental in treating dry eyes. The purpose of the omegas is to make healthy tears. A stable, healthy ocular surface is an important factor in providing you a good visual outcome. 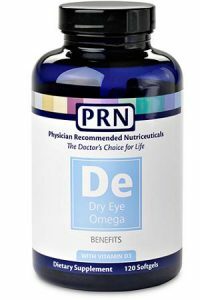 The doctors at Specs Appeal recommend PRN Omega dry eye benefits for the following reasons. “PRN omega-3s are clinically tested, safe and effective. Your body will recognize it just as if you were eating a piece of fish”.